Properly cared for in captivity, Rainbow Lorikeets have been known to live for up to 30 years. 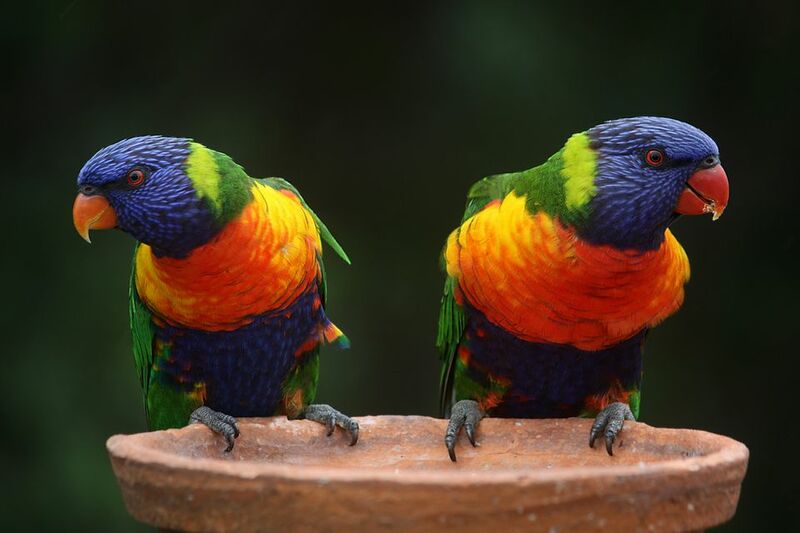 Rainbow Lorikeets are sweet, affectionate birds who are known for their comical antics and congenial personalities. In most parrot species it is imperative that young birds be hand-fed to be properly trained to step up and acclimated to human touch, however many have noted that even wild Lorikeets seem to be quite friendly toward people and easy to socialize. Rainbow Lorikeets certainly live up to their name—their faces and bellies sport a deep blue plumage, with green feathers on their wings, backs, and heads. They have bright red breasts with highlights of yellow and orange on the sides. Their bright red beaks offset nicely against the blue of their facial feathers, and they have dark, grayish-black skin on their feet. They are simply one of the most colorful species kept as companion birds. Unlike other parrots, Lories and Lorikeets in the wild survive mainly on nectar and flower pollen. If you look inside of a Lorikeet's mouth, you'll notice that their tongues have uniquely adapted "brushes" on the tips to help them harvest these foods from the plants in their environment. In captivity, Lorikeet owners feed their pets either commercially available or homemade nectar mixes, which must be prepared fresh several times daily. It's also very beneficial to supplement a pet Lorikeet's diet with treats like oats, fresh fruit, edible organic flowers, and green vegetables. Rainbow Lorikeets are very active birds, so they require a good amount of exercise to maintain optimal health. A Lorikeet should be provided with a very large cage so that they have room to climb and fly. Also, a minimum of 3-4 hours of supervised, out-of-cage playtime is required for their physical and emotional health. Overall, Rainbow Lorikeets make excellent pets for those who are committed to providing excellent quality care for their pets, and who have plenty of free time to spend with them. These are friendly, funny, affectionate birds who typically bond strongly to their owners, so it is important for those who want a Rainbow Lorikeet to realize that adopting one of these birds means committing to 20+ years of daily interaction. Like all parrots, Rainbow Lorikeets love to play and need to be provided with plenty of toys to keep their minds and beaks busy! They are avid chewers, so many Lorikeet owners suggest stocking up on "destructible" toys made of safe woods so that they can exercise their beaks. While cleaning up after any pet bird can be quite a mess, Lorikeets are known for being especially messy due to their liquid-based diets. When choosing a location for a Lorikeet's cage, it's important to consider this and place the cage in an area where there is no carpet and where the floors and walls can be easily wiped clean. Many people line their walls with plastic sheeting to protect their walls due to the fallout resulting in their highly specialized diets. Thankfully, Rainbow Lorikeets are very intelligent birds and can be easily "potty trained" if an owner so chooses. If you think you can meet all these special needs, then a Rainbow Lorikeet might be a good choice as a pet for you. Before rushing out to bring one home, however, do as much research on the species as you possibly can. Call up local Lorikeet breeders and make an appointment to meet with them and their birds to see if you think you could handle day-to-day living with a Lorikeet in your household. You won't regret taking the extra time necessary to make the right decision—but jumping into the wrong decision can be devastating.